Unlikely, unless you of course count the calories that we over eat, and then of course the percent would be more like 75% instead of 40%. Humans need to consume less, causing stores to stock less, causing less waste. The supermarkets are to blame as well, along with the producers who are producing too much and wasting too many resources and they are still compensated by the government for their output. Farmers should be compensated less, forcing them to produce less, causing stores to stock less, and hopefully forcing people to buy less. It all sounds great in concept, but it can never be. Humans are wasteful, especially Americans. In supermarkets, how many products just sit on the shelves, and then need to be thrown away. I see so many items near their sell by dates, filling up shelves. "It cites several reasons, including that food has been so cheap and plentiful in the United States that **Americans don't value it properly. **"
I think I smell a leftist, citizen-of-the-world wealth-transfer proposal in our future. Much of the food we consume today is contaminated by vitamins, minerals, and other harmful nutrients. Until these things are completely removed from our foodstuff, we will continue to be an unhealthy nation. For this reason I consume mostly twinkies and packaged cup cakes. I'm laughing my head off at this comment...well done! that's a funny take on the health crisis. Vitamins and minerals are good. I think you are confusing it with steroids and anti-biotics in meat which was given to cows; then there are pesticides etc...on vegetables and fruits, unless you buy organic. .....you end up with unwanted pharmaceuticals in your body. Also if anyone has ever shopped at a low end grocery store and paid close attention, many canned goods and boxed foods are WELL PAST their expiration date. Some as much as yrs! Most of this problem is stockpiling by manufactures and sales! There's so much preservatives in them, they last years! A good report, but very little in the way of concrete suggestions of how not to waste. It seems clear that the problem needs to be addressed on all levels. Another silly report with outrageously inflated numbers. There may be waste in the system but the cost to prevent it would outway the benefits. This isn't a study, it's a biased opinion at best. Otherwise, create a firm show how savings can be obtained and cash in on the 165 billion. Remember, a billion here a billion there pretty soon your talking about real money. Thanks to Everett Dirkson. Using the math in this article, a family of four would waste 80 lbs. of food each month. At the article's stated cost of $1,350 to $2,275 that amounts to somewhere between $16.87 and $28.43 PER POUND of food. That is several times the cost of prime steak where I live. Now that the numbers in the article are shown to be just plain sensationalistic garbage, no point in paying attention to anything else the writer bothered with. Who edits this stuff? John, you are right. The actual report states $1365-$2275 in waste ANNUALLY for a family of four, which is like $115-$190 per month. Still sounds a little high, but more realistic. Poor editing. Thanks for noticing this. I've just went back into the report to double check and we have corrected the error. What's truly horrible about this is that there are adults and children going to bed hungry every night. We're supposed to be a civilized country – why can't we set up a channel that funnels this leftover food to local organizations that can distribute it to the needy?? Maybe they should lower their prices & reduce the amount of their product they serve... Restaurants are ridiculous with their portions & a lot of food gets thrown away. Many large grocery chains do donate food right before expiration to their local food bank. Food Banks distribute this food out to all of the smaller agencies that cannot store the food. Millions of pounds are used this way. If all chains did this and if farmers donated less "pretty" but still nutritious produce we could help solve the problem of so much food yet people are still hungry in this country. I know the local Dunkin Donuts throws out all there donuts at the end of the day because they can't donate them. They used to donate to the local homeless shelters until someone threatened to sue when they got sick(which was nonsense.). Or they could donate them to the local precinct. I waste more than that, the crap sold in the Arizona grocery stores is old and not fit to eat. I purchased bagged french green beans paying $4.99. When I prepared them yesterday they were moldy. 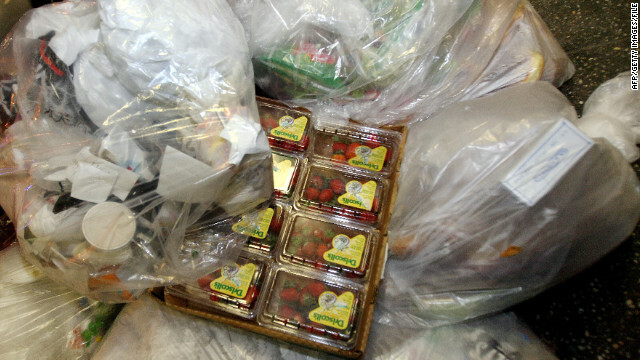 produce that is sold has been in storage and is old, tough skinned and dry out inside. Coming Soon: Heavy fines (tax) for NOT clearing your plate. "Eat all your peas, Billy!" I don't waste much, but I go to the store about 2-3 times a week.